Plot: Spider-Man ends up working with his ex, the Black Cat, when all of the Marvel heroes start losing their equipment and weapons. Black Cat tells Spidey the culprit is the Thieves Guild and she’ll help him for a price. Meanwhile Mary Jane Watson investigates a support group for friends and loved ones of superheroes. Story: Nick Spencer’s antagonist for this arc, the Thieves Guild, is an interesting choice. This is probably the only story involving the Thieves Guild that doesn’t feature Gambit from the X-Men. 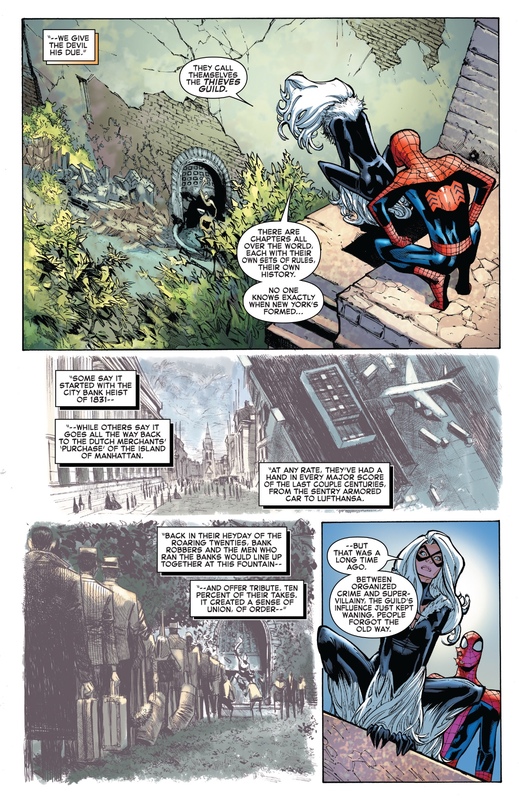 Also the way Black Cat explains the Thieves Guild’s history to Spider-Man shows that they have a larger presence in the Marvel world. Plus it was really helpful seeing a flashback of a younger Felicia with her father as he’s dropping off his dues to the Guild. 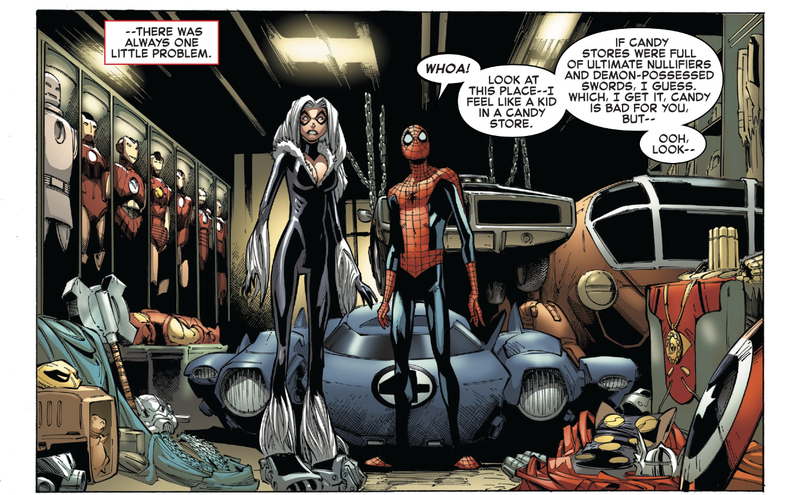 I really enjoyed Black Cat’s presence in this story. Nick Spencer’s writing is slowly bringing her back to her classic role as a thief and femme fatale. It’s also moving her away from her recent crime boss position (which I never really enjoyed). 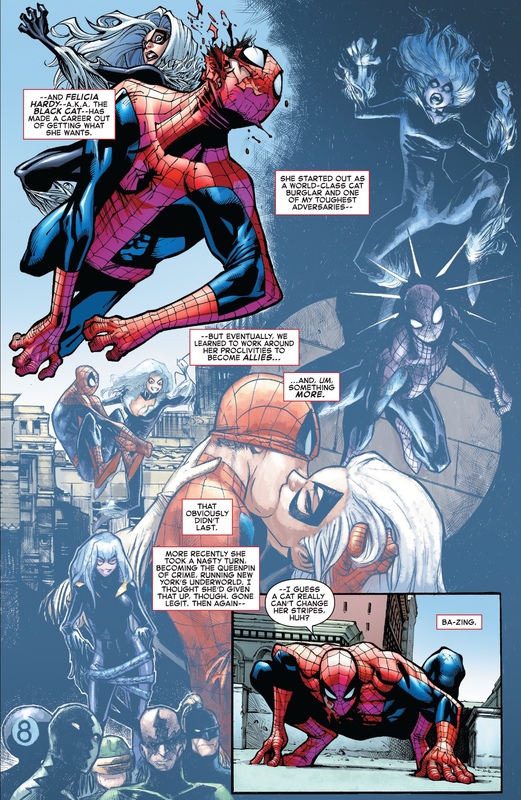 Plus Spencer’s dialogue does an excellent job showing Spider-Man and Black Cat’s history while giving readers an idea why they didn’t stay together. Also it can’t be a coincidence that they decided to write this arc after the first Spider-Man DLC featured Black Cat last month. This issue also creates a subplot involving Mary Jane Watson. After a run-in with Carlie Cooper (Peter’s ex), she hears about this support group for loved ones of Superheroes called the Lookups. MJ investigates the group and finds out it was founded by Edwin Jarvis. The subplot really adds more to MJ’s character in Amazing Spider-Man. Plus it shows that even though the two are back together, everything’s not perfect. Although the idea of the Lookups feels very similar to a story currently published by DC Comics. Art: This issue’s artwork is amazing. The colors choices for the character are bright and dynamic which really help them stand out on the pages. Also the panel layouts provide some great story flow, especially when we see Spidey and Black Cat break into the Thieves Guild compound. Speaking of, when Spider-Man and Black Cat find the stolen loot, there are some great details in the objects. I admire this dedication because most of the time these scenes look like random piles. 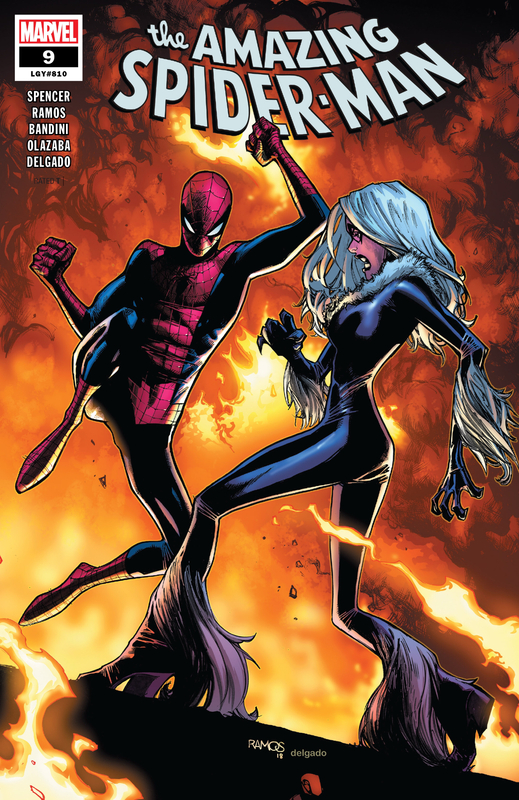 Verdict: If you’re a Black Cat fan, then you’ll enjoy this issue of Amazing Spider-Man. The use of the Thieves Guild is interesting and makes sense for the Black Cat to be involved. Also there’s an interesting subplot for MJ that adds some more depth to her character. Overall this issue is an entertaining but unnecessary read.